Does closet organization cross your mind along with a tight feeling in your stomach as you look at your jam-packed closet? Is that a resounding YES!!? Ok - ok...This is not the time to be making jokes - open the closet door and let's get to work. Now you should know that anything is commonly considered organized when it looks like everything has a correct order of placement. Also organizing often involves the development or introduction of customized or off-the-shelf organizing systems so you can find needed items in a minimal amount of time. Step 1 - You will remove the items from your cluttered closet so as to visualize the total space available and to start fresh. Step 2 - Sort the items into different piles. These piles may consist of any or all of the following: "keep", "throw", "donate", "sell", "fix/repair", and/or "give to friends. This is an important step - because it's up to you to make the final determination as to the status of any particular item. This is definitely not the time to be to sentimental. Step 3 - You may introduce organizational products like bins, shelves, or filing systems. These can create a visually appealing area that is customized so that you can easily retrieve what you're looking for. And best of all - you can maintain the "system" with minimal effort. Step 4 - Educate yourself on organizational techniques. There are several popular television programs like Clean Sweep, Neat, Mission: Organization, Clean House, Life Laundry and NeatTV as well as magazines like Real Simple, and many articles that appear on a regular basis in a wide range of media. 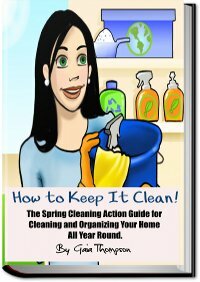 There is also my personal favorite home organization book available - so you have no excuses. It is important for you to part with unnecessary or unused items to enable you to achieve the goal of a simpler, less cluttered lifestyle. You can start with closet organization...so get to work.